Many of our customers compare our sausage to the flavor their parents and grandparents tasted. Our sausage season begins Thanksgiving week, Tues Nov 24th, and continues through January 20, 2016. 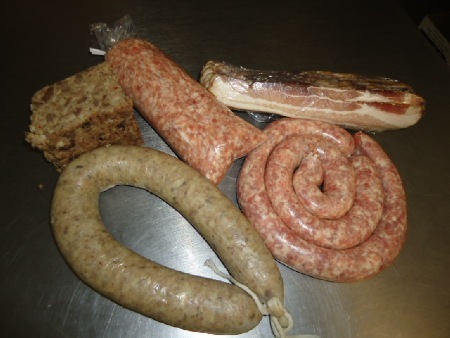 We offer a variety of sausages made, weekly, here on our farm. Our Fresh Sausage Flavors are: Plain salt/pepper; Sage; Garlic and Hot. These flavors can be purchased fresh in link or bulk or smoked links. In addition we have smoked hams and bacon, also, headcheese, ponhas and fresh pork cuts. All of our sausage is made with NO MSG or fillers; only whole hog trimmings and seasonings. We combine Hickory, Sassafrass and Cherry woods to smoke all of our smoked sausage, ham and bacon. Our smoked items are guaranteed a double thumbs up! Your family will love our sausage, bacon & ham products. FRESH IS BEST! OUR FRESH SAUSAGE FLAVORS ARE: PLAIN SALT AND PEPPER; SAGE; HOT and GARLIC. We use Whole Hog Trimmings, salt, white pepper, black pepper along with Rubbed Sage; Crushed Red Peppers or Fresh Garlic in our sausage. OUR SMOKED SAUSAGE FLAVORS ARE: PLAIN SALT AND PEPPER; SAGE; HOT AND GARLIC. Our Sausage is smoked with a combination of Apple, Hickory and Sassafras woods. WE ARE KNOWN FOR OUR GREAT LIVER SAUSAGE. A TRADITIONAL FAVORITE! WE OFFER SMOKED HAM AND BACON SMOKED ON SITE WITH A COMBINATION OF APPLE, HICKORY AND SASSAFRAS WOODS. OLD WORLD FAVORITES: HEADCHEESE AND PONHAS. Give us a call at 812-963-3175 or send us an email at maysefarmmarket@mw.twcbc.com if you would like to place a sausage order. 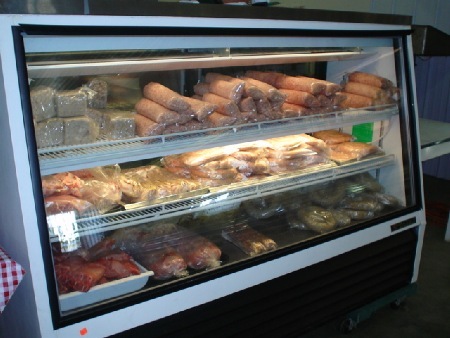 Our hours during Sausage Season (Nov - Jan) are: Tuesday - Friday 9 - 5 and Saturday 9 - Noon. Closed Sunday and Monday.